Former Georgia President Eduard Shevardnadze has died aged 86. His aide Marina Davitashvili said he had passed away on Monday after a long illness. In 1992 he became the head of state of Georgia after it broke away from the Soviet Union. He led the country out of instability and civil war but in November 2003 was toppled in the "Rose Revolution" sparked by opposition allegations of irregularities in parliamentary polls. Born in 1928 in the city of Lanchkhuti, Mr Shevardnadze joined the Communist Party's youth movement in 1946 and became the party's head in Georgia in 1972. In 1985, he was appointed foreign minister of the Soviet Union under reformist leader Mikhail Gorbachev and was credited with helping end the Cold War. Mr Gorbachev told the Russian Ekho Moskvy radio station that Mr Shevardnadze was a "very capable, talented man, very much predisposed to working with people, with all strata of society". 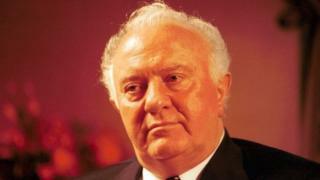 Mr Shevardnadze resigned from the post of foreign minister in 1990 before briefly taking it up again in 1991 as the country was disintegrating. He spent his final years in a quiet retirement in the capital, Tbilisi.